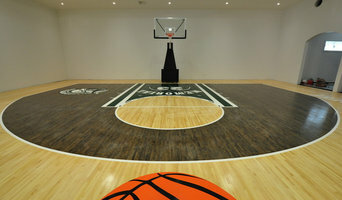 Athletic Floor Installations, annual maintenance, repairs, complete re-sanding, painting custom graphics and re-finishing. 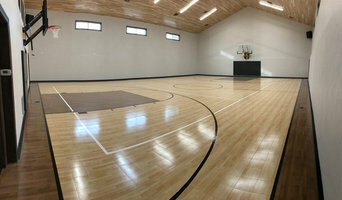 Hardwood, Basketball, Rubber, Sheet Vinyl, Poured Urethane, Vulcanized Rubber, Weight Rooms, Stages, Aerobics and Dance. 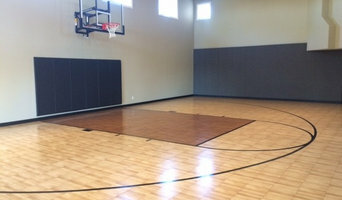 Athletic Modular Tile, Basketball Systems, Game Nets, Hockey & Soccer Goals, batting and Golf Cages, Backyard Game Courts, Home Gymnasiums, Garage Courts for Commercial & Residential Customers. There is only ONE, Sport Court! Wisconsin and Minnesota's largest Sports Construction company. From the small backyard basketball court to the full size Tennis Court, Home Gymnasium too! We are the most experienced team in the area. For 27 years we have been under the same ownership and our youngest sales professional has been with the firm for 18 years! We are the number 1 provider of backyard fun in the nation! Our courts are the safest and most durable in the industry and are backed by a 25 year warranty. Custom built to each unique yard, we work with you to design the best court for your yard. Our installation process is designed to make the smallest interruption to your life as possible. Call (414) 856-5690 to schedule your free estimate today! Seven Things you MUST Know Before Hiring a Janesville Personal Injury Attorney. Free Checklist for Hiring a Personal Injury Attorney in Janesville, WI. Parker Sniatynski while at Saint Louis University was a member of The Student Athletic Advisory Committee (or SAAC. Mr. Sniatynski chose involvement with the committee based on its objective of enhancing student life on campus. Parker Sniatynski helped in organizing career fairs and speaker events focusing on the transition into the workplace after college. Parker and the SAAC worked directly with the NCAA to improve the quality of the college experience for student-athletes. As a collegiate baseball player, some of the highlights of Parker Sniatynski’s career include: playing in every game as a junior with a .299 batting average, starting in all but one game for the Billikens, and going 5-for-5 with two runs scored at UMass on April 13. Parker Sniatynski also posted 11 doubles, four triples, and four home runs. During the transition, the use of new finishes, fabrics and lightweight structural supplies led to substantial reductions in handling charges. The resultant economies in freight, installation and dismantling, drayage, storage and refurbishing helped to defray the fees of these dramatic new custom trade show exhibit design. First and foremost, your Wisconsin backyard court builder should have in-depth knowledge of sport rules, regulations and standards: court dimensions, net heights, lane widths and much more. If you’ll be teaching your friends, kids or others how to play, or if you plan to play on a competitive level, following national guidelines is important. Backyard court builders also keep tabs on the latest in athletics technology to provide you with the most updated options possible for your Waukesha, WI court. With your input, they’ll design a space that’s customized for your wish list and your home, then handle the construction. When the inevitable wear and tear starts to show, your Wisconsin backyard court builder can repair, resurface or replace the aging elements. To ensure consistent quality and style, your backyard court contractor might also work closely with a Waukesha, WI general contractor, remodeling contractor or landscape professional. Here are some related professionals and vendors to complement the work of backyard courts: Outdoor Play Systems, Landscape Contractors, General Contractors. 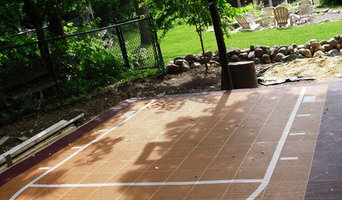 Narrow your search in the Professionals section of the website to Waukesha, WI backyard courts. You can also look through photos to find examples of Waukesha, WI courts that you like, then contact the contractor who worked on them.